Welcome to The 08th MS Team rewatch! Things get pretty serious in today’s episode and the series proves that Gundam isn’t just about giant robots fighting it out with beam sabers. It can also make you think about the price people are willing to pay to uphold their ideals of peace. Shiro Amada is facing an inquiry under suspicions of being a spy. Similarly, Aina is being interrogated by her brother Ginias for how she acted in the last episode. He believes she’s in love with Shiro but she argues that she was only trying to survive and doing so required working together with the enemy. Both of them argued that they believe there are good people on both sides of the war and believing in that gives them hope that one day there will be an end to the war. The Federation soldiers at the inquiry laugh at the idea. In the jungle, Kiki and some village children witness three Zakus walking up the river. The pilots appear to be lost. They spot the village and head there to get some food. 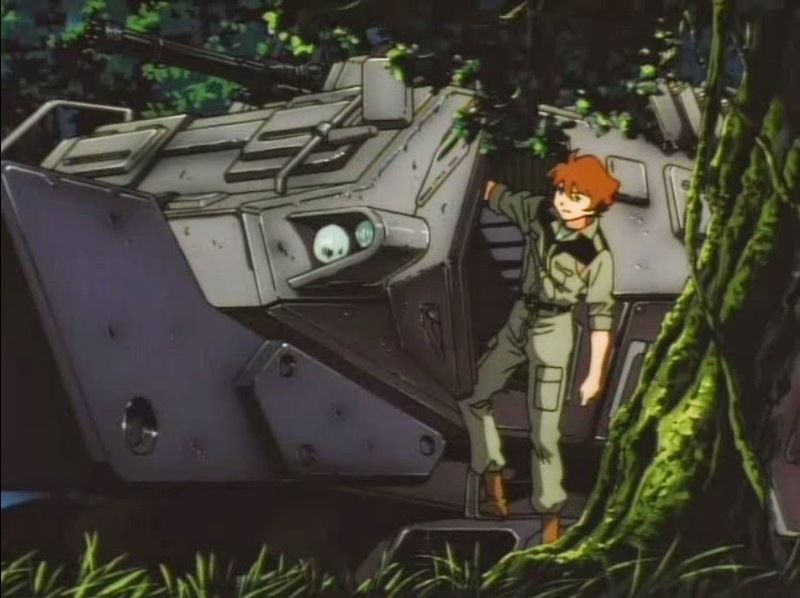 Kiki is hoping that they can give the Zeon pilots the food they want and have them leave before they can discover that her village is the guerrilla resistance in the area. At the Federation base, Michel, Karen and Sanders are spending time in the bar and other soldiers inform them of the situation happening at Kiki’s village and that the base commander doesn’t think it’s important to protect the village. The team goes to Shiro to let him what they’ve just found out. Shiro warns them that going to protect the village against the base commander’s wishes could get them court martialed. They just want to help their friend so Shiro orders them to help the village and by doing so put any potential blame solely on him. Jidan mentions that to the team but tells them there is another way. He shows them a blank order form with base commander Kojima’s signature on it which he is willing to sell but Shiro dismisses him. Karen, on the other hand, takes the form and follows the team. They plan to take out the Zakus from a distance, 10 kilometers away. Shiro wants to avoid turning the village into a battle zone. One of the Zaku pilots is harassing the villagers and embarrassing them. 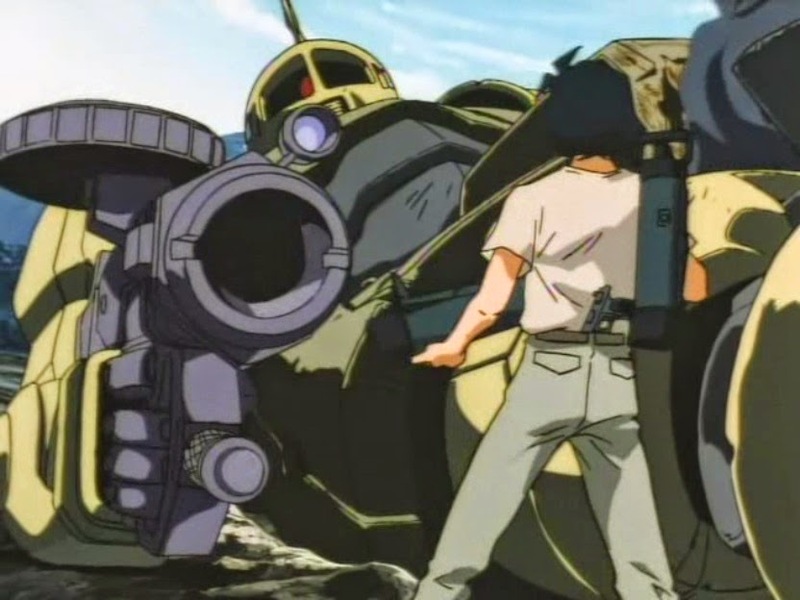 One of the villagers gets pushed too far and launches an RPG into the Zaku’s open cockpit, effectively killing the pilot and destroying the mobile suit. The other pilots realize it’s a guerrilla village and they try to escape. The guerrillas aren’t going to them leave so easily and they attack in force. Shiro tries to convince the villagers to lead the Zakus to the river to avoid the village’s destruction. They argue that they want to destroy the Zakus in retaliation for killing their chief, Kiki’s father. Shiro then admits that he doesn’t want to hurt the Zaku pilots or the villagers. The 08th Team proceeds to incapacitate the Zakus without killing their pilots. Shiro single handily takes out one Zaku armed only with a bazooka. Defeated, one of the Zaku pilots attempts to kill as many villagers with her as possible. Shiro is faced with the decision to either kill the enemy pilot or let the villagers die in the pilot’s final attack. He kills the Zeon pilot. While the villagers mourn their lost after the bitter victory, Shiro contemplates just how difficult it is for him to live up to his ideals. “Duty and Ideals” is an episode that brings to focus some of the main themes of the series: wars are fought by people and pacifism is a form of strength of character, not a weakness. Shiro’s reluctance to kill has been present since the very first episode but it’s been pushed aside for a few episodes in order to focus on developing the members of the 08th Team. He doesn’t have a problem with violence, especially when used defensively, but to actively seek to kill is something that doesn’t sit well with him. It’s going one step to far. Still, Shiro doesn’t go full on pacifist in this episode. He uses the Federation’s military resources to oppose Zeon’s military troops while trying to cause as few injuries and deaths as possible. He takes on a defensive approach and that’s consistent with his behaviour in previous episodes. While it wasn’t pleasant to watch because it was sad, I appreciated that the show took the time to address Kiki’s feeling for Shiro and how he feels with her. They act like friends but they’re also very playful and it hints to deeper emotions. When Kiki sees Shiro in the village she thanks him for saving her. Shiro replies that he’s not just here for her, he’s here for the whole village. The body language suggests that she has feelings for him. She’s visibly upset that he doesn’t reciprocate the feelings she’s developed for him. I really like that beam weaponry is a big deal. It’s still new technology at this point in the Universal Century timeline. 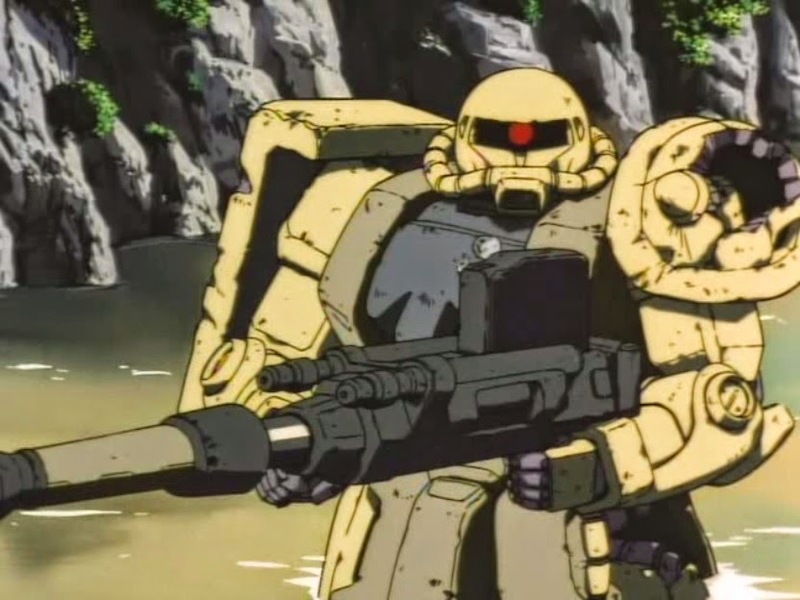 Soldiers and mobile suits still use traditional bullet weaponry, missiles and grenades more than they use beam weapons. It’s noteworthy to point out when an enemy has a beam weapon during a battle because it causes very serious damage and it’s difficult to defend yourself against it. 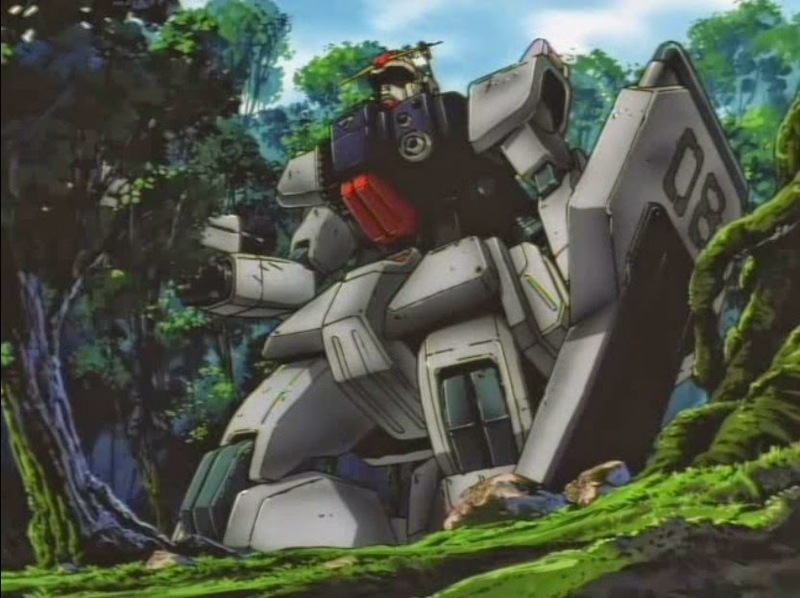 If it’s a big deal that a mobile suit has a beam weapon during combat, it stands to reason that presence of a huge beam weapon on the front of the Apsalus is indicative of its vast power and destructive potential. So far the series has been flirting with the contradictory nature of having soldiers discuss and think about peace before, during or after armed combat. At times it was poorly handled in how obvious the contraction was. I thinking specifically of Aina voicing the opinion that she believes the development of the Apsalus will aid in ending the war and herald in an age of peace. The dual desire to wish for peace and using war as a means to attaining peace is one of the main themes of this episode. The humanisation of the enemy is also an important theme. The Zaku soldiers have lines of dialogue and we see all of their faces more than once. Their reason for going to the village is a basic, human need. They’re looking for food. All this is to give the viewer a sense that these Zeek pilots are real people, too. Zakus and other mobile suits might look like robot, but they all have a human pilot. During his inquiry, Shiro is asked whether or not he would still be able to shoot an enemy soldier, Shiro admits that he’s not sure what he would do. Later on, he experiences the scenario in combat and his decision is to shoot the enemy. The show addresses the contradiction between his ideals and his actions head on by having him later admit the difficulty of reconciling the two. That the series address this issue directly while still maintaining a level of action and entertainment as it does is what makes this a good show. It’s a common staple of war fiction and while the subject was handled poorly in earlier episodes, it’s very well done here. I’m reminded that this same contradiction is present is all of the Gundam series I’ve watched but it’s rarely been developed as well as it is here. Shiro’s decision to shoot the Zaku pilot isn’t the only option available to him in that situation, nor is it necessarily the only action he’ll ever take in similar situations. All it really shows is that in that particular situation it was more important for him to protect his friends than to let them die in order to satisfy his own ego in the knowledge that he stood firm on his beliefs. It’s also very important for him as a character that he thinks about his actions. It was a difficult decision for him to make and he will continue to think about his actions and wonder if he did the right thing. It’s so nice to have such a good episode follow the mess that was “Reunion”. Here’s hoping the next one is just as good.